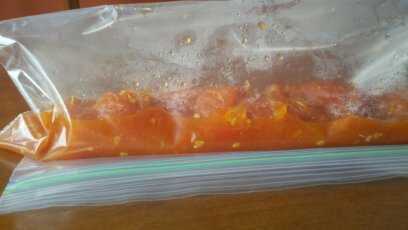 Make a big batch and store in the fridge for 7-10 days or freeze for up to six months. They add a delicious layer to soups, sauces, stews and spreads. 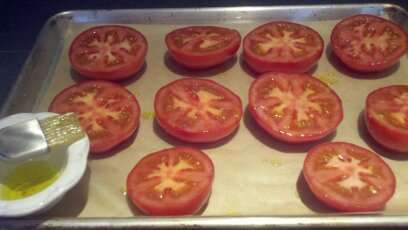 It’s also a great way to use extra garden tomatoes up at the end of summer when they all seem to come ripe at the same time. Tomatoes are everywhere in Greece. You’ll see apartment verandas and rooftops all over Athens dotted with small container plants of tomatoes and herbs. It’s rare to find a balcony without fruits or vegetables growing on it even in the most cosmopolitan areas. Many homes in the suburbs, towns and villages have small garden plots and weekend community gardening has become popular recently with urbanites. This is one just north of Athens, Ecoktima. 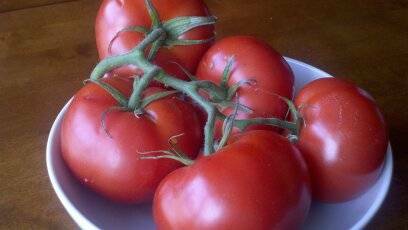 When I have to use store bought tomatoes, I try to find vine ripe. They’re definitely more expensive but I think they’re worth it. For best roasting, I like ones that are not too hard and not to soft, but just right. Here are some beauties I found this week. 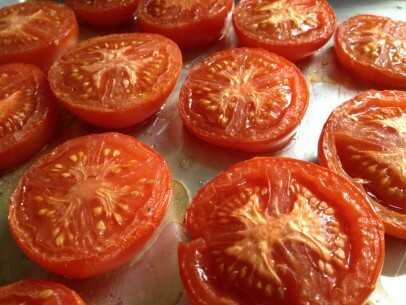 Something to mention and my father always make a point of – I don’t season the tomatoes while cooking. This way, they can be used in any dish which you then can season as a whole. I use them regularly in lentil soup and my favorite Better Than Ketchup spread and – ok, too many to mention here. I’d love to hear how you like to use them! Try these few easy steps and let me know what you think? Freezing is a good way to have them at hand whenever you need them. I freeze 2 cup batches in zip close plastic bags and simply thaw for 15 minutes in a bowl of cold water before using. You can certainly microwave them, I’m just not a fan of that method myself. stored frozen – not the greatest pic, but you get the idea! A nice thing, and something you may not know, about Greek gardening is that men are often the gardeners. My grandfather settled in a suburb just north of Boston and had a lot of land a couple of towns over with a huge garden. He grew all sorts of fruit trees and vegetables. The family called it “the farm’. The Farm became a gathering place for his six children and their families with a small summer shack and a long table outside. Sadly, I never knew my Papouli as he passed away before I was born so the farm is only known to me in story. I loved the story of your Papouli, as it sounded like my Dad. When we bought our home in Redondo Beach, CA, the first thing he did was to plant a Lemon Tree and a Fig tree. Some…40 years later both are great producers, esp. Lemons I have year round. I miss him very much, as he knew intuitively how to do and fix everything! 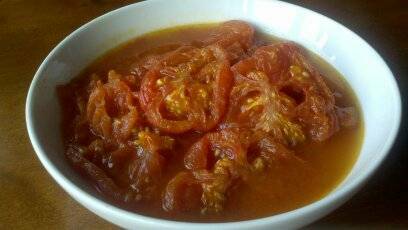 Your Fasolakia recipe is how I remember from my Yiayia!! Thank you for posting and G-d bless you! !